Genealogy is by far one of the most popular hobbies in the United States. Joining DAR does not require an interest in genealogy, but it helps to have some knowledge of one’s ancestry. Regardless of race, religion, or ethnic background, any woman who can prove lineal descent from a patriot of the American Revolution is eligible for membership. Our chapter ancestors include over 200 patriots and represent 14 states, including 12 of the original 13 colonies and Vermont, the first state added to the newly formed United States (1791). These numbers continue to grow as new ancestors are identified each month. Do you have a Revolutionary War patriot in your family tree? Consider membership in the National Society Daughters of the American Revolution (NSDAR), a volunteer women’s service organization that honors and preserves the legacy of our patriot ancestors. More than 200 years ago, American patriots fought and sacrificed for the freedoms we enjoy today. As a member of the DAR, you can continue this legacy. 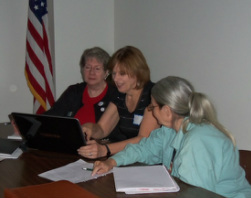 The Sallie Harrison Chapter regularly holds Lineage Research Workshops, where members are available to answer questions and help demystify the process of preparing an application and gathering the documents needed to prove lineage to a Revolutionary War patriot. Prospective members can work with chapter members to identify potential patriot ancestors.